With the main focus on food security, the Nigerian Minister of Foreign Affairs, Mohamed Bazoum, will be meeting with researchers at UMB. With the main focus on food security, the Nigerian Minister of Foreign Affairs, Mohamed Bazoum, will be meeting with researchers at UMB tomorrow to find out if successful research results in neighbouring Mali could be duplicated in his home country. UMB’s Department of International Environment and Development Studies, Noragric, has been conducting research on integrated soil fertility management in Mali since 2000 in collaboration with the Drylands Coordination Group. 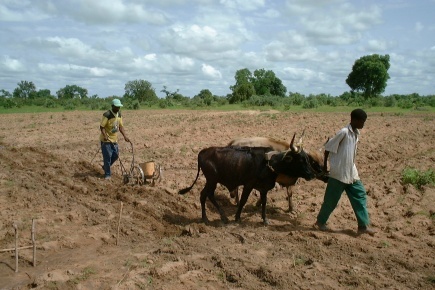 Noragric is currently involved in the five-year project ‘Adapting agriculture and livestock production in Mali to climate change’, funded by the Norwegian Ministry of Foreign Affairs. The visit from Niger will explore the possibilities for collaborating with this project. The overall objective of the project in Mali is to improve food security by making agriculture and livestock production in northern and central parts of the country more resistant to climate change. The method includes seed priming (soaking seeds 8 hours prior to sowing), application of small amount of mineral fertilizer (micro-dosing) and simple mechanization of sowing. The project has shown excellent results and many Malian farmers are now using the technology. Many development actors in Mali are already making use of the methods. Niger is the largest country in West Africa and one of the poorest countries in the world. The population of some 17 million people depends on agriculture, mostly subsistence agriculture and animal husbandry. The country is regularly affected by long droughts contributing to food shortfall. According to the World Bank, Niger is one of the countries in the world that is most severely threatened by food insecurity. A new programme has recently been launched in Niger, the “3N Initiative: Nigeriens Nourish Nigeriens”, which aims at increasing food security and building agricultural capabilities. The initiative will depend on international support in the form of funds and expertise. UMB’s experience with climate smart agriculture and the positive results in Mali are thus very relevant and will be high on the agenda when Mohamed Bazoum comes to UMB tomorrow together with a delegation consisting of officials responsible for food security in Niger and accompanied by individuals from the Norwegian Ministry of Foreign Affairs.